The unprecedented global development of palliative care over the past 50 years, originating in a counterculture and evolving through to an integral element of the health-care system, has enabled many more of the world’s population to have access to quality palliative care. More of the world’s population, particularly those living in high-income countries, such as Europe, North America, Australia, and parts of Asia, now die at an older age of, or with, noncommunicable diseases. The need for palliative care is also significant and largely unmet in low- and middle-income countries such as sub-Saharan Africa where communicable diseases such as HIV/AIDS, tuberculosis, and malaria continue to lead to expected deaths for many people. These new patterns of dying have implications for the configuration of international, national, and local palliative care policies, health-care service delivery models, palliative care delivery, engagement with primary and specialist clinical streams, workforce education, and the focus of future research. 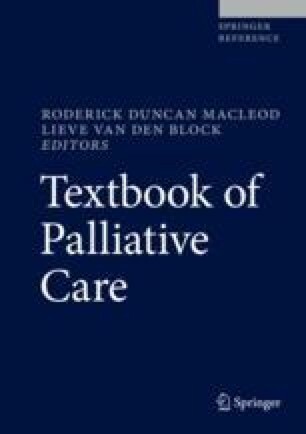 This chapter will describe the current and future challenges to palliative care development in low-, middle-, and high-income countries and the opportunities offered by adopting a public health approach, novel technologies, and remote monitoring and better engaging communities to increase palliative care access globally. Australian Government Department of Health and Ageing. Palliative care curriculum for undergraduates: learning resource fact sheet. 2005 Retrieved 12 Mar 2010, from http://www.caresearch.com.au/Caresearch/Portals/4/Documents/PCC4U_Fact_Sheet.pdf. Department of Health and Ageing. Program of experience in the palliative approach. 2012. Retrieved 19 Nov 2012, from http://www.pepaeducation.com/. Health Intelasia. Hospice care in China. 2013. Retrieved 2017, 10 August from https://healthintelasia.com/hospice-care-inchina/. Meier DE. New palliative care policy aims to reduce barriers. 2016. Medical ethical advisor, Retrieved 30 July 2017, from https://www.ahcmedia.com/articles/139460-new-palliative-care-policy-aims-to-reduce-barriers. Spence D, Greaves N. Caribbean palliative care association requests Hon. Courtney Rattray, Jamaica Ambassador to the UN, to include community based palliative care in high level meeting declaration. 2017. Retrieved 10 Aug 2017, from http://www.ehospice.com/articleview/tabid/10686/articleid/22213/language/en-gb/caribbean-palliative-care-association-requests-hon-courtney-rattray-jamaica-ambassador-to-the-un-to.aspx?utm_campaign=website&utm_source=sendgrid.com&utm_medium=email. World Health Organization. Declaration of Alma-Ata. International Conference on Primary Health Care, Alma-Ata, USSR, 6–12. 1978. September 1978 Retrieved 17 Aug 2017, from http://www.who.int/publications/almaata_declaration_en.pdf. World Health Organization. Building blocks for action innovative care for chronic conditions: global report. 2002. Retrieved 26 Mar 2008. http://www.who.int/diabetesactiononline/about/icccglobalreport.pdf.